Slow Digesting, Extended Release Protein For Maintaining And Increasing Lean Muscle Mass! Grizzly Casein is a slow digesting protein filtered from milk that continues feeding the muscles after whey proteins have been fully digested. The slower absorption allows for more ideal net protein balances in the body for sustaining elevated amino levels. 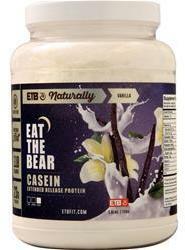 ETB prides itself on bringing you the purest form of any supplement on the market and Grizzly Casein is no exception with a unique feature of Sustained Amino Acid Release and Anti-Catabolic action. Because of micellar casein’s inherently unique 3-dimensional amino acid composition and structure it aggregates in the low pH of the stomach. This unique characteristic results in prolonged digestion, slowly over time providing a steady, continuous release of amino acids into the blood stream. The prolonged release effectively helps reduce catabolism and provides muscles with sustainable pool of amino acids to reduce muscle breakdown. TO MAXIMISE YOUR RESULTS, consider supplementing this product with ETB Pure Isolate Whey Protein line, ETB BCAA’s and ETB Bear Essentials Multivitamins.